Initial Cryptocurrency Offerings (ICOs) are the flavor du jour in the sprawling Crypto-Tech market. I’ve been following and analyzing their development early on, in addition to being in private conversations with several entrepreneurs who are planning or have done them already. At their essence, they represent a fundamental shift into how companies get funded, when compared to the traditional Venture Capital driven methods, as I described these differences in How Cryptocurrencies and Blockchain-based Startups Are Turning The Traditional Venture Capital Model on Its Head. What I inferred from that post is that the way forward is a clever combination of both worlds, the old and the new, a point that Zenel Batagelj from ICONOMI picked-up in ICO 2.0 – what is the ideal ICO?, a good post that I recommend you read. For background, I’ve already described the Best Practices in Transparency and Reporting for Cryptocurrency Crowdsales in a lengthy post, about two years ago. Re-read it, because much of it still applies increasingly so, and for a new reason: there are several more ICOs today than in early 2015. Arguably, the bar is higher now because if you want to comprehensively evaluate an ICO, you need to look at some new dimensions instead of just the one about being a startup. But at the same time, the bar can appear to be much lower because no one is forcing new investors to examine these four areas with the same required rigor that venture capitalists typically exercise, and specific ICO regulation appears to be lax or non-existent, which is OK initially, but let’s not digress. That’s where all the traditional VC stuff goes in. In a non Crypto-Tech world, VCs would continue their jobs as they always have, by making investment decisions based on evaluating startups, one at a time. This is where the traditional “team-product-market” trifecta evaluation comes in, and I’m not going to rehash what happens in that dimension. It often takes a career lifetime to perfect how to invest based on pattern recognition and drawing your own guideposts for making decisions. You can’t replace that, and you can’t fake it either. In here, you can add such topics as competition, go-to-market approach, product roadmap, and implied valuation. A warning signal emerges when newcomers start offering broad brush evaluations without having had the benefit of direct investment experience that includes lessons learned from having made good and bad decisions. Here we enter crypto-tech territory. This part covers the sheer mechanics of the cryptocurrency sale, including its legal and regulatory aspects. In what jurisdiction is the company incorporated? What legal structures are being disclosed? What is the token distribution structure? What are the apparent, perceived or real regulatory risks? Are there plans for external or internal audits? If there is a DAO-like component, is its articulation realistic and well grounded? Who has written up the token issuance contracts and actual token issuance software? Which blockchain infrastructure is backing-up their sale? Have they published the terms and conditions of the sale in clear language? Have you talked to at least 3 other entities who have successfully done a token sale before? The Coin Center has published a very good analysis, Could your decentralized token project run afoul of securities laws? that is worth reading. It mentions two important points to keep in mind: 1/ tokens must be a utility to the operations of the business, and 2/ they should only become available after your operations, not prior. With public money comes greater responsibility. Doing a public crowdfunding campaign is a two-way street. It’s almost like being a public company from Day One. It’s not easy being in the public eye. If you can’t deliver the transparency, don’t take that path. And if we don’t self-govern to higher standards, the regulators will come and put a damper on this journey. This is all still true and applies 100%, and relates to how you plan on communicating progress visibility. Is the company providing public dashboards? Does the company have independent auditors? Are their delivery promises well articulated so that they could be later measured? Does GitHub or another public repository reflect their progress, and has a given track record? How will they continue to communicate their progress? Are they blogging regularly about their work? Are the team members well identified with links to their LinkedIn profiles? Do they have external advisors? Do you have plans to list your cryptocurrency on public exchanges, and which ones have you talked to? This is a critical part that should not be taken lightly, and it should be figured out early on. It pertains to building a case for why a cryptocurrency model is the right path for this company. The basic premise is about how tokens are related to the business model of the company. The token is supposed to tie everything together. For example, in the case of the Bitcoin blockchain, Bitcoin as a currency is totally ingrained in that blockchain’s operations, and it is at the center of a variety of actions: transaction validation, value exchange, miners rewards, store of value, transaction fee, currency for services, etc. In the case of Ethereum, ETH is used to reward miners, as “fuel” that funds smart contracts, and it is also a proxy to other tokens that can be created and managed on the Ethereum infrastructure. For Steem, it is the currency that rewards contributors, and it’s a currency they can spend in other services. What is the purpose of the token? What function or utility does it perform? Can you describe a viable economic model behind it? How does value flow from the outside of the ecosystem to the inside, and vice versa (not counting speculatory trading on public exchanges? 2) outside of your market and into the cryptocurrency markets in general or the real world. For example, can your users just spend and earn their coins inside or can they also spend them outside of your application? If you are using a currency that has available liquidity (such as BTC, ETH or even recently STEEM), you benefit from the broader network effects of these currencies, but if you are creating have your own proprietary currency, your interdependency liquidity may take a little longer to materialize. For example, Steem has done a good job crossing boundaries between their cryptocurrency-governed site Steemit, and the real world and demonstrated it at their recent Steemfest in Amsterdam. Here are 4 examples I describe in a recent article, Steemit’s First ‘Fest’ Reveals the Power of Blockchain Community that showcase this cross-pollination of transactions between the crypto-world and the non-crypto spaces. Do You Really Need an ICO? Do you really need an ICO with its own currency or perhaps you may just want to use an existing cryptocurrency that attaches to your model, in which case the ICO might be burdensome and risky? Of course you can spin your own coin and hope the economics of the business model will natively support it for the long term, but you could also decouple the token from your model and treat it like a currency that is pegged to an existing popular one (e.g. BTC, ETH or STEEM). On the positive side, despite the current Wild West appearances of the ICO market, some known best practices are emerging to create and evaluate ICOs. 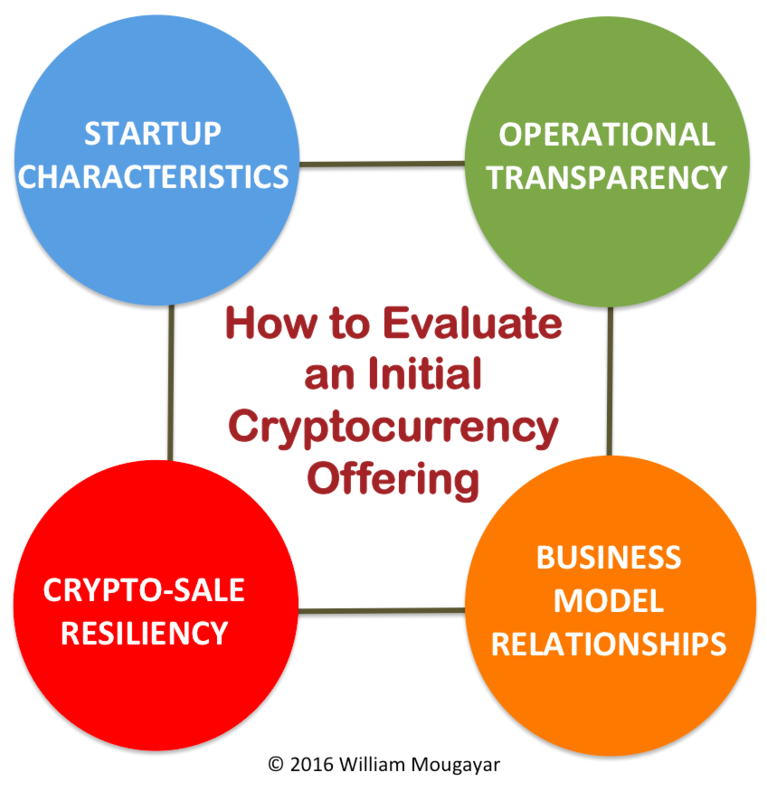 Whether you are an entrepreneur planning for an ICO, an investor trying to decipher how to evaluate them, or a regular pondering their future, do not ignore the guidelines proposed in this article.